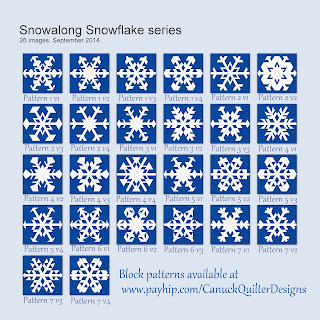 Over 4 years ago, when I designed my paper pieced snowflakes, I only had time to make small projects with them.. I have runners, a pillow and a tote bag sporting various snowflakes. I always planned to make a larger quilt big enough to snuggle under when it's cold and snowy outside, but I never quite got around to it. Now I think I never quite got around to it because I hadn't come up with quite the right layout. Just after midnight one night a couple of weeks ago one little tweak to the design popped into my head. I got up and tried it out in EQ right away, and my enthusiasm for these snowflakes came roaring back. Just one little tweak was all it needed. Fabrics came out to play this week while cold snow fell outside, pushing other work to the bottom of my list. I haven't been excited about any new projects in awhile so I am riding this wave of enthusiasm! Despite the enthusiasm there isn't much to show yet. I spent time working out cutting directions for the whole quilt rather than cut one block's worth at a time. I thought that with 26 snowflakes, things could get messy and wasteful quickly if I cut each snowflake's parts individually. 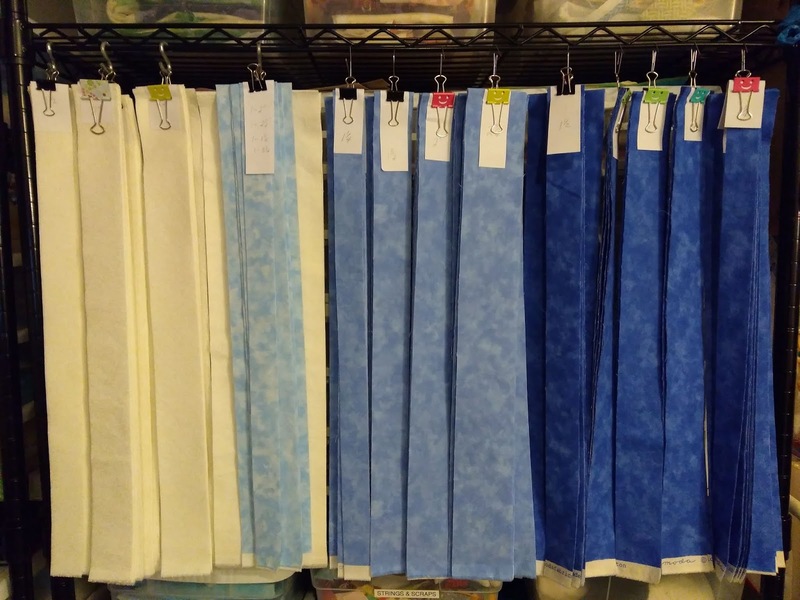 I gathered all my snowflake cutting charts, added up numbers for identical cuts, and figured out how many strips of each fabric in which width would make most efficient use of my fabric to make all 26 flakes. I won't subcut these strips all at once. The plan is to cut just what I need from the appropriate strips for one snowflake at a time. I'm happy to put these smiley face binder clips to good use to keep my strips sorted. Santa tucked them in my stocking at Christmas, as though he knew Id need them. I work tomorrow, but on Sunday I plan to start making snow. I LOVE these snowflakes. I only made one but saved the fabric and some printed paper to make more. It’s on my ironing surface right now! So pretty.....will be awesome as a group. Oh, I like the strip idea! I'll be starting a different paper piece pattern soon - I will keep that in mind. Love your fabric colors. This will be pretty! I'm going to enjoy watching this one come together for you. It is going to be beautiful! I'm glad that one little tweak came to your mind. ---"Love"
Oh, this is going to be beautiful! 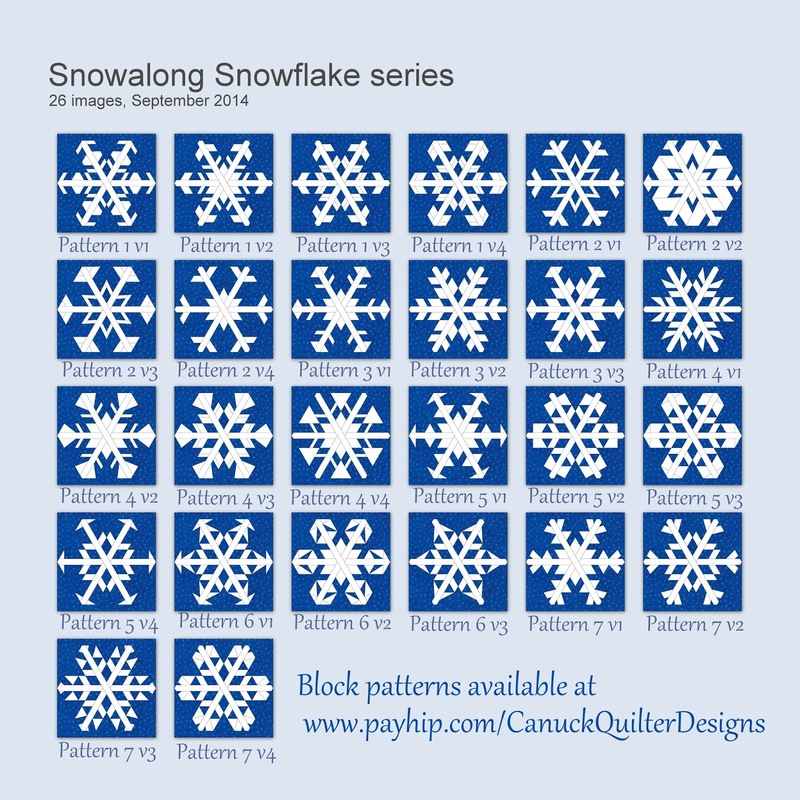 When all is said and done, will you make a pattern available for sale for the setting? I already have all the snowflakes. 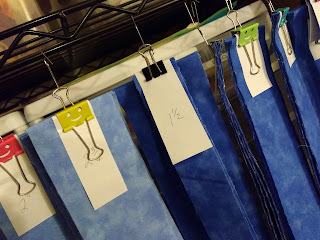 Great idea for keeping those strips organized! Can't wait to see your snowflakes. 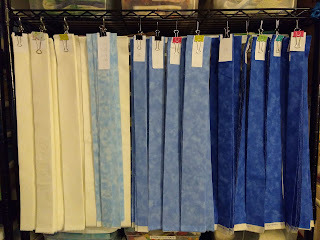 Wow, lots of fabric cut, sometimes I am just in a mood to cut fabric. You did a lot! Now it is all ready for the next step. 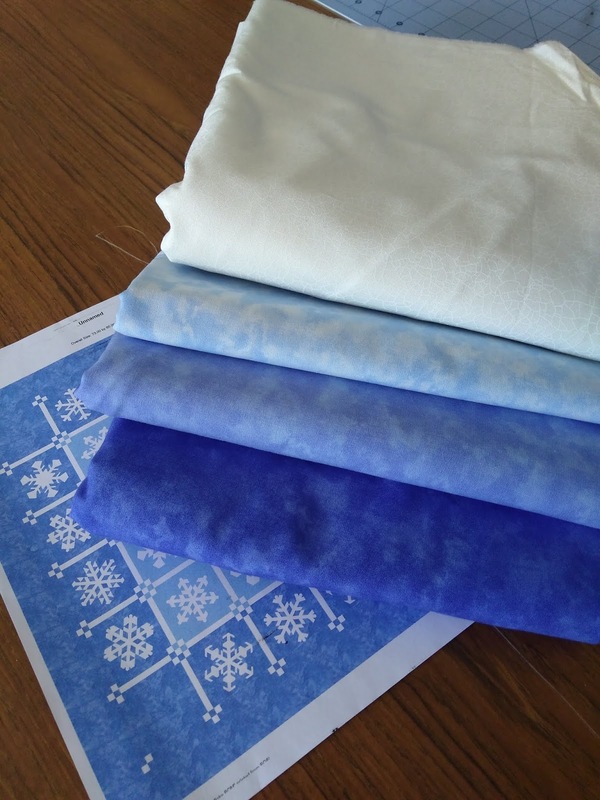 The quilt design you have pictured will be so pretty! Oh my, this quilt will be a stunner. The layout you have designed really let's the snowflakes shine or should that be sparkle? What do snowflakes do? Cute smiley face clips and the strip idea is really clever. Snow - may I have some please? 40 degC here today. Oh those binder clips! (I might have an office products addiction...) I can't wait to see the quilt - it looks amazing from your teasers. And that must have been one amazing idea to get you out of bed in weather as cold as we've been having!